MILWAUKEE — Alleviating anxiety with a cup of coffee or hot chocolate is a concept created by a researcher at Concordia University Wisconsin. Jack Toner, a senior at Marquette University, tried the specially formulated hot cocoa in hopes of bringing down his stress level. "It's really subtle, which is what I like," said Toner. Now he's hooked. "So the way I describe it is when you're hungry you get hangry. Like you're a little bit more prone to irritability. When you're missing things like magnesium you're more prone to be anxious," said Toner. Magnesium is one of the ingredients in the Satori products, along with other vitamins. Dr. Kwadwo Owusu-Ofori is a pharmacy fellow and adjunct professor at Concordia University Wisconsin. He had the idea for the creamer and cocoa from asking people how they wanted to take medicine. "They were like, I want to use cupcakes. I'd rather eat cookies, fruit punch," said Owusu-Ofori. He landed on coffee and hot chocolate because it can easily become part of someone's routine. Instead of waiting weeks for a prescription to build up in your system, this is almost instantaneous. "They are able to feel the effects within five to 10 minutes," said Owusu-Ofori. Owusu-Ofori said because this is considered a dietary supplement you don't need a prescription, but that doesn't mean you shouldn't talk to your doctor first. "We want to make sure that whatever solution that we come up with is something that can go a long way with what a psychiatrist or psychologist is normally prescribing," said Owusu-Ofori. Some businesses now offer the product. At Ward 4 in downtown Milwaukee, workers have access to the anxiety-relieving powders. "It dials you in so that that way you can still be productive, get your work done and kind of just sets your mind at ease," said Kristen Adams. People can take the product when symptoms come up or use it every day, like Toner does, as a preventative measure. "I wasn't looking to rely on this. I was looking for just a little boost on my stressful days," said Toner. Marina Roesselet, the owner of Third Point of View in Walker's Point, is the first retailer to sell the product on store shelves. "It really does help bring your mind into focus when you're having one of those crazy days," said Roesselet. You can purchase a can online here. It costs $25. If you use it every day, Owusu-Ofori said it should last about two weeks. As for the taste, Owusu-Ofori worked with a local chef. "I call it like a confectionery masterpiece, to be honest," said Owusu-Ofori. The hot chocolate mix contains coconut cream, maple sugar, pure cane sugar, Ghanaian cocoa powder, kosher vanilla flavors, L-theanine, magnesium glycinate, magnesium gluconate, glucose and GABA. The vanilla steamer coffee creamer contains coconut cream, maple sugar, pure cane sugar, kosher vanilla flavors, L-theanine, magnesium glycinate, magnesium gluconate, glucose and GABA. Owusu-Ofori hopes the creamers and cocoa will eventually be sold at grocery stores. 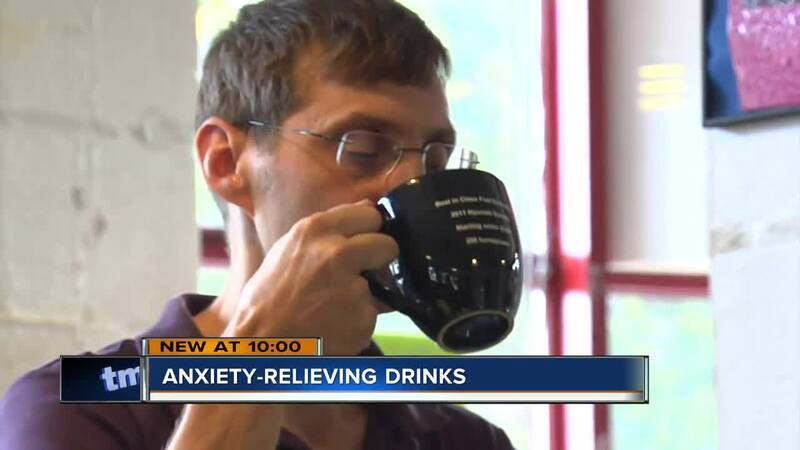 "We weren't able to make products that will stop people with anxiety from drinking coffee, but we were able to create a product that can maybe help it work better with the anxiety conditions," said Owusu-Ofori.